GeoEngineers Principal Jon Robison, PE has been chosen by the American Society of Civil Engineers (ASCE) to lead the Task Committee creating a Manual of Practice on the Direct Pipe® trenchless method. The committee will be comprised of engineers, contractors and equipment manufacturers and suppliers from across North America and Europe. A manual in this ASCE series contains information useful to the average engineer in his or her everyday work, in this case Direct Pipe. Robison has been providing geotechnical, trenchless, geohazard, construction and geophysical project management and engineering services since 1997, and he is a registered Professional Engineer in 15 states. He has led the development of GeoEngineers’ Direct Pipe design process since the technology emerged. GeoEngineers staff, led by Robison, has completed engineering and construction services on numerous successfully completed Direct Pipe projects in the United States and Mexico. He is a member of ASCE and has presented seven technical, peer-reviewed papers on Direct Pipe engineering topics at industry conferences. Robison is also involved in the trenchless pipeline industry as a member of the North American Society for Trenchless Technology, in which he also serves on the annual No-Dig Conference Program Committee. In addition, he currently represents GeoEngineers on the Industrial Advisory Board for the Trenchless Technology Center at Louisiana Tech University. He works from GeoEngineers’ location in Springfield, Missouri. GeoEngineers’ pipeline services include the entire life cycle of trenchless projects. This includes geohazards analysis and geological desktop studies; pipeline route selection assistance; feasibility analysis of trenchless methods, including geometry, workspace and constructability; and geotechnical investigations before engineering and construction begins. GeoEngineers also assists in pipeline projects with trenchless design engineering, bid specification preparation and pre-construction support, permitting, construction observation with detailed daily reporting, and post-construction documentation. 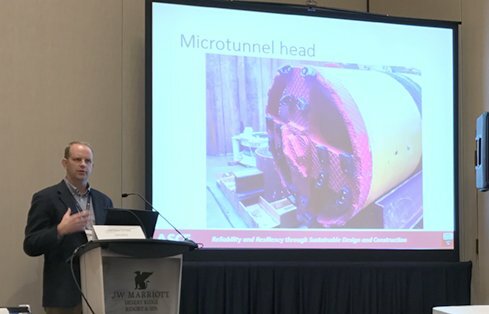 Jon Robison presenting at ASCE's Pipeline Conference in 2017.